It is my goal to provide each and every one of my clients with exceptional legal advice and service that exceeds their expectations. My experience, expertise and knowledge allow me to obtain the best results possible in a timely manner. I adhere to the highest ethical and professional standards, and have the utmost respect for all of my clients. I aim to develop strong relationships with all of my clients on a foundation of trust and confidence. Chris practices in the areas of corporate and commercial litigation, as well as real estate. He acts as counsel to, amongst others, land developers, mortgage lenders, trustees in bankruptcy and entrepreneurs. Chris obtained his Honours Bachelor of Arts degree from McMaster University in 1994 and thereafter attended the University of Western Ontario, where he obtained his Bachelor of Laws degree in 1998. He was called to the Ontario bar in 2000 and has been successfully practicing law in Hamilton ever since. Chris has appeared at all levels of court in Ontario, including the Ontario Court of Appeal. He is a regular fixture at the Ontario Superior Court of Justice and has a lengthy and varied trial experience at that level. 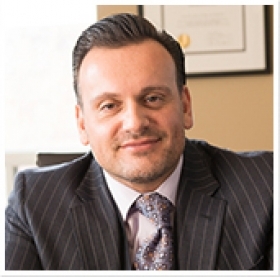 He employs a dynamic, practical and business-oriented approach to legal problems and is a well-respected member of the Hamilton legal community.